2016 for me has been a year filled with struggles yet my struggles have been overshadowed through my relationship with God. Over and over the following scripture has proved itself truthful.“I have told you all this so that you may have peace in me. Here on earth you will have many trials and sorrows. But take heart, because I have overcome the world.” (John 16:33, NLT) And strangely enough it is the trials, sorrows, and struggles experienced that causes the hunger and thirst for a deeper relationship with God. My theme for this year has been: 2016:Year of the Blessing. And when I began I expected the mountain top blessings. I looked for my lung capacity to improve, it did not I was diagnosed with prostate cancer. Many of the other mountain top blessings I expected never materialized. While I expected mountain top blessings as 2016 comes to an end and I look back instead of mountain top blessings they were gentle rolling hill blessings chief among them were the ever present unrelenting presence of the Holy Spirit. 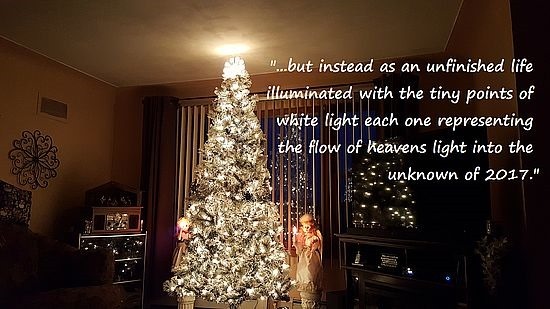 As I sit here in our living room looking at our partially decorated Christmas Tree it stands not as a beautiful showroom decorated Christmas Tree but instead as an unfinished life illuminated with the tiny points of white light each one representing the flow of heavens light into the unknown of 2017. I have chosen for the theme of 2017 as 2017: Anticipating and Experiencing Jehovah-Jireh, the LORD who sees and provides. I firmly believe as long as we keep anticipating and experiencing God the gentle rolling hill blessings will fill 2017, and maybe, just maybe somewhere along the journey to 2018 we’ll experience a few mountain-top blessings as well. Only God knows and He rarely gives sneak previews. Happy New Year from Patti and Gary Piper! I loved the year of blessings even though they were not mountain tops the blessings were small and many times subtle in ways that I could only see them in retrospect. And I am anticipating 2017 – a year another year of Emmanuel -God with us!! !